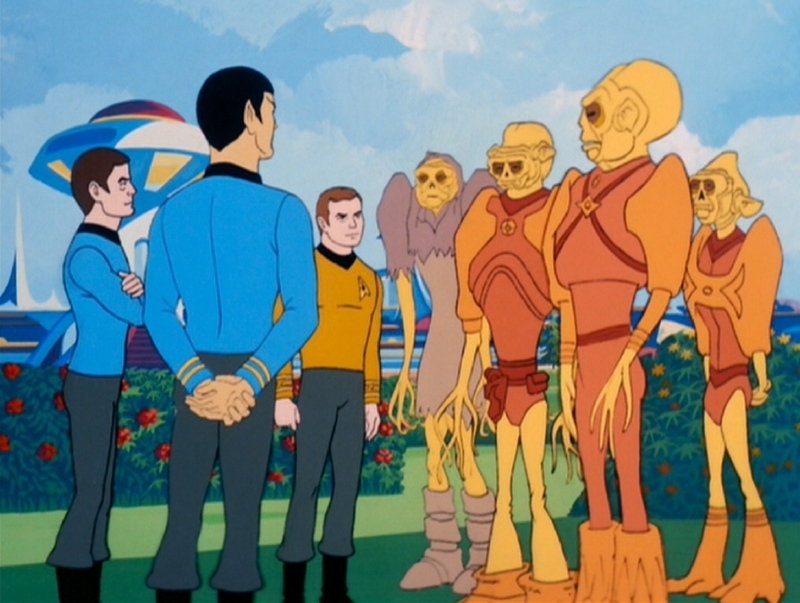 Animated STAR TREK - "Albatross"
Returning to a planet where Dr. McCoy headed a mass-innoculation program against Saurian virus 19 years earlier, the U.S.S. Enterprise crew find that McCoy is wanted for starting a plague that killed most of the planet's population following that earlier visit. Leonard McCoy entered medical school at the University of Mississippi in 2245. In this episode, we learn that while still a medical student, the 24-year-old McCoy lead a mass-inoculation program on Dramia II in 2351. To produce the dramatic skin pigmentation symptoms of the Auroral Plague, Filmation animators merely painted the skin of the characters a different color - no expensive make-up needed! 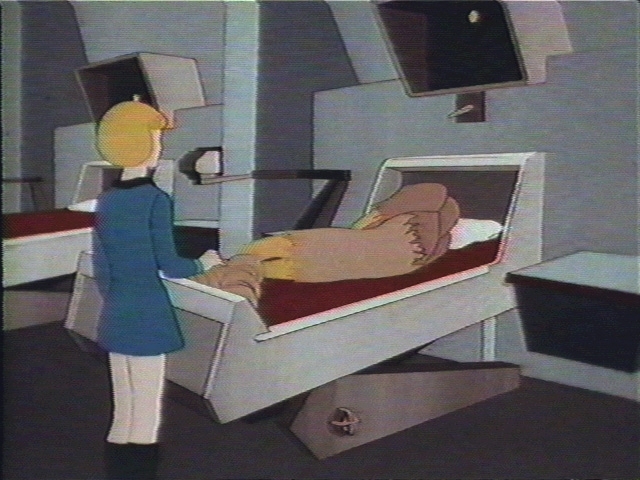 Like in all STAR TREK series, the sickbay as well as the bridge in the animated series is often the location for pivotal and dramatic scenes such as the climactic moments of this episode. 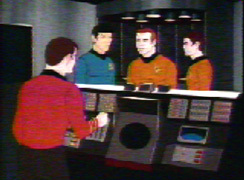 In this episode, Spock invokes Starfleet General Order #6 which states "If everyone aboard has perished after 24 hours, the ship will self destruct to prevent the disease from spreading." While breaking McCoy out of jail, Spock knocks out a guard with the Vulcan Neck Pinch which was seen many times in the original series. In this episode, McCoy must race against time to find a cure for a disease affecting the crew just as he did in such original series episodes as "Miri," "The Naked Time" and "The Deadly Years." 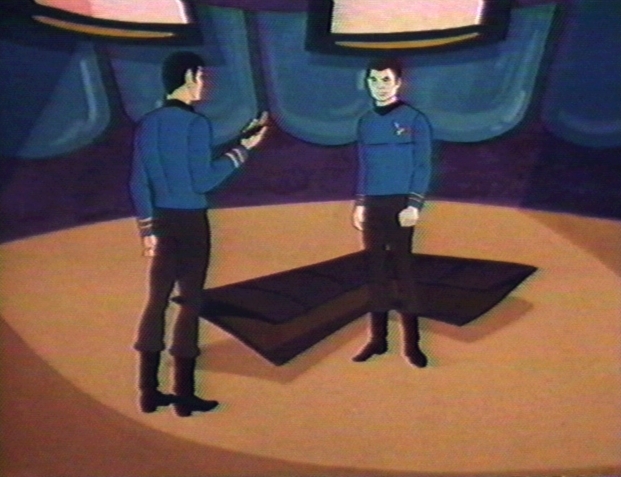 This episode featured the popular character Dr. McCoy who was portrayed in the original series and voiced in animation by DeForest Kelley. There was recently published an authorized biography of the beloved actor entitled From Sawdust to Stardust - The Biography of DeForest Kelley, Star Trek's Dr. McCoy. This book contained some information about the gentle actor's involvement with the animated series. The biography indicated that Kelley welcomed the voice acting work on the animated STAR TREK, especially since his early career began in radio. So, for Kelley, reading dialogue for animation was child's play, and he really enjoyed himself. 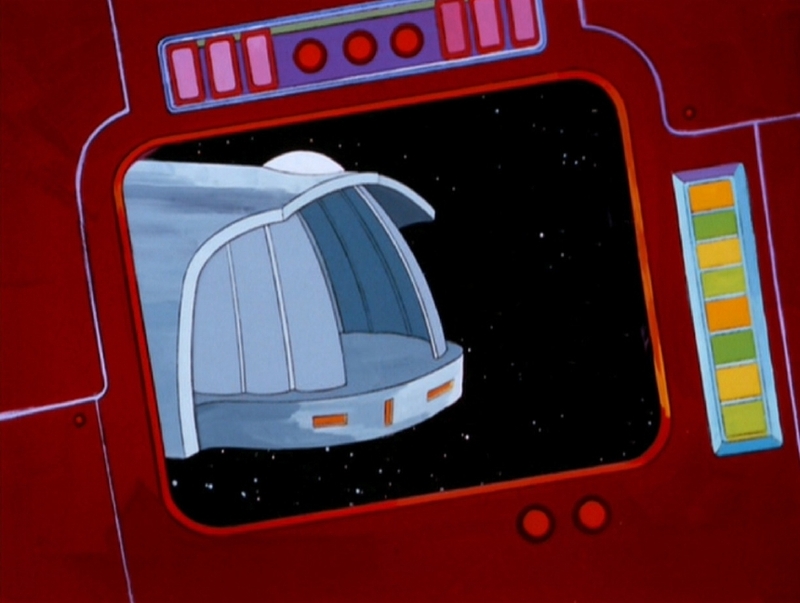 In this episode the Enterprise's Shuttlecraft Hangar Doors were seen opening from the outside. This was too expensive to show on the original series since it would have entailed an expensive new model. 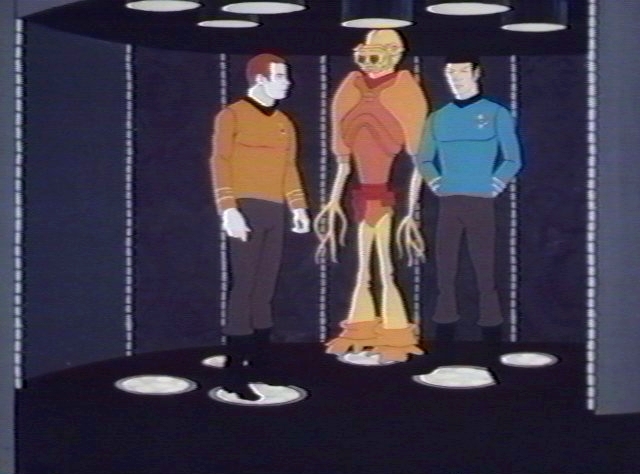 This episode featured the Dramans a very alien-looking species that was one of the hallmarks of the animated series. Dramans were a technologically advanced civilization of tall, large craniumed humanoids from the Draman star system. The Dramans were known for the swiftness of their justice system. Auroras are luminous color bands in the skies over polar regions of earthlike worlds. 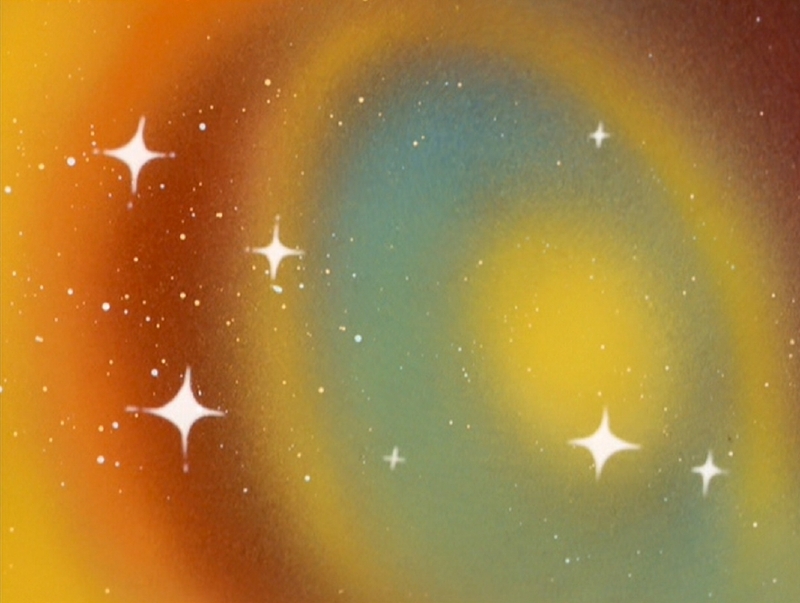 As seen in this episode, another variety of auroras occur as space-borne phenomena where concentrations of high-energy radiation produce the colorful display (pictured). There is a page in this site that focuses on the Draman Patrol ship that was used by Demos in this episode. The director credit associated with this episode was Hal Sutherland on the episodes as originally aired on television in the 1970's, 1980's and 1990's and as released on video tape and laserdisc. However, the DVD release of the animated series in 2006 changed the opening credits to indicate that Bill Reed was the director of this episode. In fact the credits of "The Pirates of Orion", "Bem" and "The Practical Joker" were similarly modified to list Bill Reed as director. Up until November 2006, it was generally believed that Bill Reed only directed the final two episodes, but in fact he directed the final six. Nurse Chapel was referred to as "Lieutenant" in this episode. "Albatross" was novelized by Alan Dean Foster in Star Trek Log Six published by Ballantine Books in March 1976. Also novelized in the book was "The Practical Joker" and "How Sharper Than a Serpent's Tooth".